British boxing star David Haye learnt about the ‘boxer of Auschwitz’, an inmate at the camp who fought for his survival, during a trip to Poland this week. The former world heavyweight champion, known as ‘the Haymaker’ learned about former prisoner Tadeusz Pietrzykowski, known as ‘prisoner 77’. He fought over 40 bouts in order to stay alive after being one of the first prisoners sent to Auschwitz. 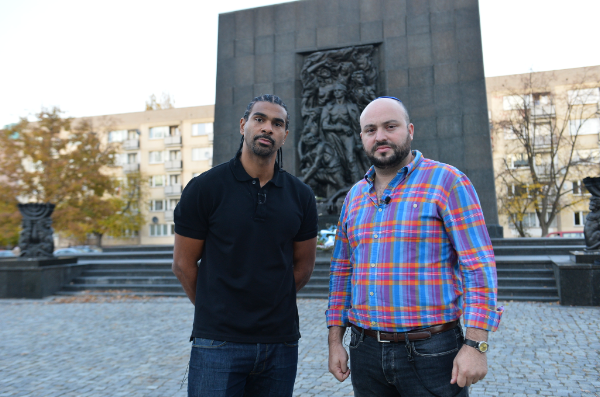 During his trip to Poland, Haye visited the Warsaw Uprising Museum, and the monument for the Warsaw Ghetto Uprising. He toured these sites with Jonny Daniels, the British-born Israeli President of From The Depths foundation, which works preserve the memory of the Holocaust in the country.